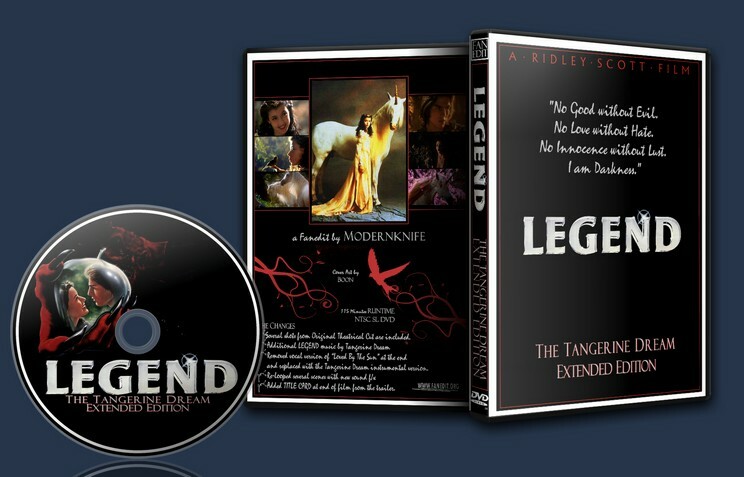 This is an extended version of LEGEND that uses the Tangerine Dream score instead of the Jerry Goldsmith score, while retaining some of the shots exclusive to the Theatrical Cut and Director’s Cut. 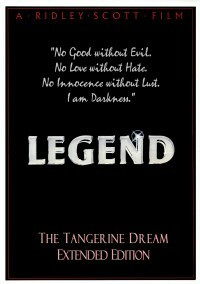 To create an extended version of LEGEND that uses the Tangerine Dream score instead of the Jerry Goldsmith score, while retaining some of the shots exclusive to the Theatrical Cut and Director’s Cut. In scenes where the Goldsmith music could not be removed, the Tangerine Dream music is mixed with and over the scenes. The Director’s Cut of LEGEND has some transfer mistakes. Throughout the film there are several “single frames” at the beginning of cuts that are still frames and appear brighter than the next frame that follows. These were removed whenever possible. - Several shots from Original Theatrical Cut are included. - Removed vocal version of “Loved By The Sun” at the end and replaced with the Tangerine Dream instrumental version. - Added TITLE CARD at end of film from the trailer.